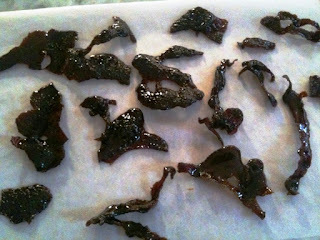 To celebrate today's snowfall (as meager as it turned out to be in Brooklyn), I decided to make molasses on snow candy from one of my very favorite childhood books, Little House in the Big Woods. "Laura and Mary each had a pan, and Pa and Ma showed them how to pour the dark syrup in little streams onto the snow." Growing up, this candy was the stuff of dreams to me; I couldn't imagine how the snow magically turned into candy. Well, as an adult I discovered it doesn't. The snow is used simply as a way to quickly harden the liquid candy. Still, it's a lot of fun to make and for all its simplicity -- only three ingredients, molasses, brown sugar, and snow -- the taste is complex. Or, as my friend Jay would say, it's delicious "on every level." 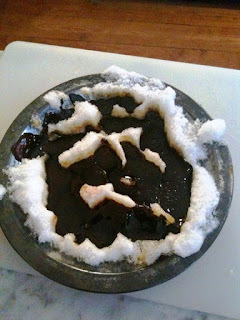 Fill a couple of pie tins with snow, and leave them outside while you make the candy. 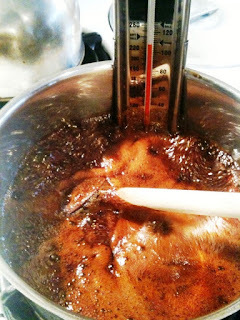 Boil molasses and sugar together, stirring often until it reaches the hard ball stage, or about 260 degrees. Turn off the fire, fetch the pans from outdoors. 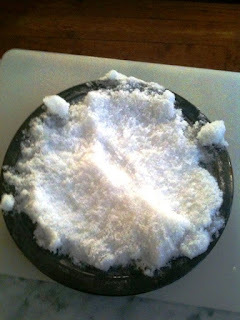 Transfer the candy into a glass measuring cup and carefully pour it over the snow. When the candy is hard, remove it to a clean towel. Enjoy! not bad but it's no cub cake!! @Margaret: You are so right! I "cemented" my teeth together for quite a while yesterday until the candy disolved (deliciously) in my mouth.